A service for health – For the fainthearted . . .
POVJ 46 was my National Health Service number. It is easily remembered because the encounters with the health service were very frequent. 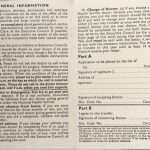 An NHS card printed with instructions on how to avail of the services recalled memories of times when the NHS was in its youth. The autumn of 1974 seemed the worst of times; the asthma had become chronic, chest infection followed chest infection and the prescriptions seemed to come in quick order. Reduced to a pale shadow by bronchitis, days would be passed reading whatever books might lie around and reading newspapers from cover to cover. Dr Ingram had been our family doctor for decades and when the asthma was especially severe he would arrive at the house with his wisdom and his old leather bag. Once he even appeared unexpectedly, peering in through the window to announce his arrival; he had just been passing. Dr Ingram would have time to talk about all sorts, even on horse racing on the television. Going to the surgery meant a journey to Langport, the small town three miles from our village. Once a week, though, a doctor would come to hold a surgery in our village. Lacking a suitable venue, the front parlour of the village pub was used as the consulting room for two hours each Wednesday afternoon. How was there so much time? Why were we so unhurried? Was the medical practice very small? Were people healthier? The National Health Service was but a quarter of a century old, perhaps the demands upon it were less severe. Perhaps the NHS Card conveyed a sense of the seriousness with which the service should be approached. 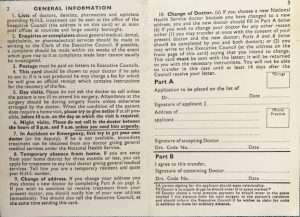 It suggested that being unable to produce the card might mean that the doctor would charge a fee for his services. In accident or emergency, one was to approach one’s own doctor first. 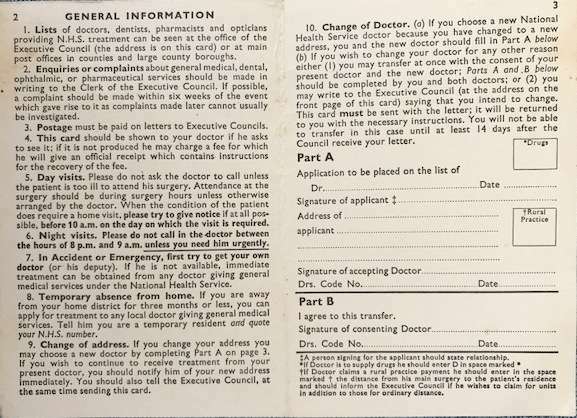 Being absent from home for three months or less meant one could approach a local doctor and apply for treatment as a “temporary resident.” Should one wish to change doctor for any reason other than a change of address, one could only do so with the consent of one’s existing doctor. From a medical system filled with a certain rustic charm, we have reached a situation where it is impossible to imagine how a modern Dr Ingram would find a place in the health service. Perhaps we are less healthy than we were, perhaps medical care has become increasingly sophisticated, perhaps bureaucracy has expanded. How now could we run a national health service with a card system?